Therapeutic laser therapy via the K-Laser provides energy in the form of light waves that change cellular metabolism, which affects the production of endorphins and relieves pain. In addition, injured cells stimulated with the laser heal at a faster rate. When used after a surgical procedure, the therapeutic laser reduces pain, swelling, and inflammation. Although improvement is often seen after the first visit, most patients require several treatments for greatest benefit. We will work with you to determine a treatment plan for your pet’s specific condition. 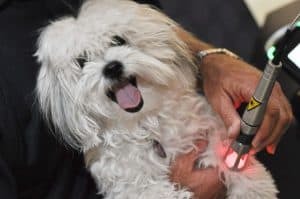 Ask our veterinarians at your next visit or give us a call for more information on how K-Laser Therapy can help your pet!